J.D. Leonard’s “Just Drive the Album” is the type of “arrival” release that artists wait their entire lives for. It’s a pronouncement. J.D. 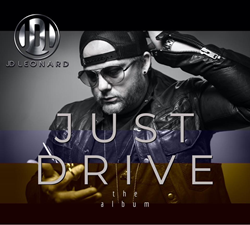 Leonard’s “Just Drive the Album” is the type of “arrival” release that artists wait their entire lives for. It’s a pronouncement. It’s the exact moment when the right songs, written by the right artist, find themselves existing in the right time. The album is a modern country offering, if only in name alone, that performs the neat illusion of being uniquely “today” while avoiding the shmarm of kiddy pop country entirely. It lives in the singer-songwriter era. It lives in the big rock anthem era. It lives in the present-day, country expansion era. Regardless of where it lives... it’s definitely alive. Leonard shines in his multifaceted role as writer, singer, arranger and guitarist. This is most evident on tracks like the rocking epic, “Good Lord Willing” where J.D.’s myriad of talents play as one perfectly working function. Equally impressive is the directional changes featured on tunes like the orchestrally punctuated ballad, “She’s Never Really Gone” (Leonard’s latest release, currently streaming in all online platforms). Leonard’s album criss-crosses through timeless influences without ever leaving the universe his characters live in. Recorded at the iconic Blackbird studios (Nashville, TN), “Just Drive the Album’s” story begins when a chemistry formed between Leonard and mega producer David Huff (of White Heart and Giant fame) while working on Bonnie Tyler’s 2013 release “Rocks and Honey.” Leonard proved to be a valuable asset in bringing the Tyler and Huff camps together and co-wrote the album’s third single “Love is the Knife.” Discussions for a Leonard solo project started to form shortly after. While early into the production process, a shake up in Leonard’s high voltage live show added a new layer to the recording complexion. Enter Billy Joel lead guitarist and musical director, Tommy Byrnes. Upon hearing an early version of the title track, Byrnes solicited Leonard for the job of lead guitarist and thus began a broader plan to bring his music to a wider live audience. With Byrnes as a full time member of J.D.’s band, (when he’s not performing with Joel at Madison Square Garden and beyond) brand new principal writing began that would incorporate a more accurate depiction of the band’s expanded strength’s. Byrnes’ contributions to the album lend city shred credit to the Tennessee born Leonard, who seems to have as much local familiarity with funk and heavy rock riffs as he has with rustic bends and red dirt declarations. He implores these creative weapons with excellent precision on the album’s finale, “And Justice For All,” a scorching theme song for the underdog in all of us. It’s a decisive encore that combines the historic escapism of country’s storytelling with a lifetime of “working musician” style education. Leonard’s road tuition has paid off in droves. “Just Drive- the Album” is a pivotal event in the career of an artist who has always lived up to his potential from behind the scenes. With the April 17th release, he won’t just step into those scenes but he’ll convince you that he’s always been there. That’s a testament to the timelessness of these performances; they’re altogether brand new and completely broken-in. Ultimately that’s what a great arrival does; it’s the fulfillment of the results exceeding the expectation. That’s just what “Just Drive the Album” and J.D. Leonard are all about.